Over the course of this week, we'll be live-blogging SXSW — the good, the bad, and the outrageously hip and sweaty. Follow Daily Texan reporters, photographers and editors as we post the highlights of our work here. For minute-to-minute coverage of the best and the worst that SXSW has to offer, follow us on Twitter at @thedailytexan. Update (12:00 a.m.): Festival-goers at South By Southwest evidently know which headliners and other popular films to see this year, as lines to gain entry to the theaters stretched several blocks and even crossed streets with heavy traffic. To get our take on which lines to join and which lines to skip, and to read our review of "Manglehorn" and "My Name is Doris," click here. Update (8:50 p.m.): If you aren’t already constantly scouring Twitter for the latest updates and news about South By Southwest, you should be. For the latest Austin news, updates on secret shows, and the musings of Austin’s own Willie Nelson, follow these ten accounts that we recommend. 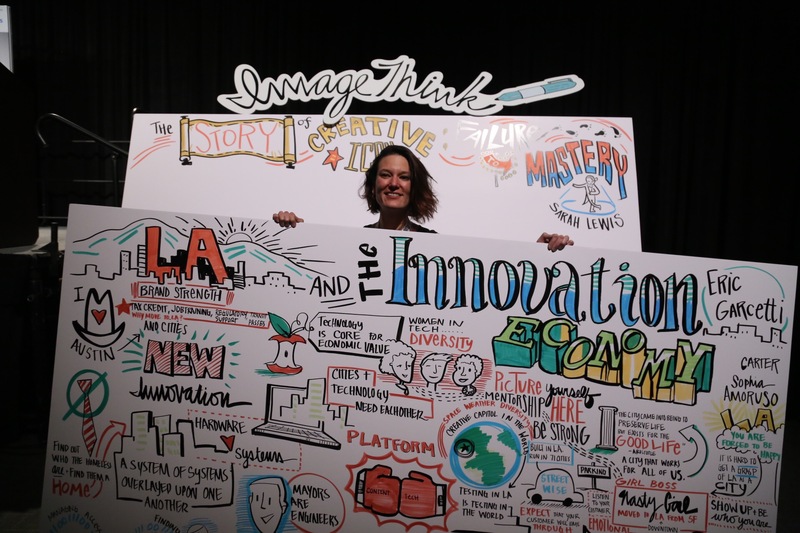 Imagine Think, a Brooklyn-based company, sends artists with giant white poster board to graphically illustrate anything from strategy sessions and business conferences to trade shows and keynote addresses. “[Imagine Think wants] to inspire creativity but also develop enhanced group learning so people can actually say ‘Oh, I see what you mean’ and mean it,” Willems said. Ckick here to read more about Williams and her work with Imagine Think. Update (4:15 p.m.): As South By Southwest picks up, more pedicabs populate the streets of downtown Austin. Pedicab drivers either pass by with smiling passengers in tow or line-up against the curbs to take a quick breather. While pedicab driver Samuel Bean awaited his next customers, he told us he’s been transporting downtown travelers since November 2013. This is his second time working at SXSW. When Bean isn’t towing attendees from one event to the next, he’s belting out lyrics on Austin stages or giving guitar lessons. As a couple climbed into his cab, Bean pedaled onto the street, shouting parting words about SXSW. “It’s a great big ball of fun!” Bean said. Update (3:10 p.m.): : Live tweeting for the panel “LA and The Innovation Economy” will begin at 3:30 p.m. The panel features mayor of Los Angeles Eric Garcetti; Sophia Amoruso, founder of online clothier Nasty Gal; and Troy Carter, CEO of multidimensional management company Atom Factory. Follow @katclarksamp and @ldlopz for more about the intersection of technology and culture as it pertains to Los Angeles. Update (1:30 p.m.): National headliners flock to Austin for South By Southwest, but the live music capitol of the world has its fair share of local bands performing at the festival, too. As you put together your South By Southwest schedule, show these Austin-based bands some love. Here are some of the best musicians Austin has to offer at this year’s event. Day two of SXSW and the weather couldn’t be better. Great for all you smalltalkers. Today will be partly sunny with zero percent humidity. Don’t expect the temperature to reach higher than 75 degrees. Check Austin’s weekly forecast here. Update (11:48 a.m.): Direct Todd Strauss-Schulson's "The Final Girls" is a smart, funny addition to the growing horror-comedy genre. The film is a brilliant hommage to the classic slasher genre, drawing inspiration from and poking fun at classic horror tropes. It's hilarious, but also suprisingly touching. Read our review of the film here. Update (10:30 a.m.): Any SXSW experience includes at least one unexpected celebrity sighting — but on Friday, Russell Brand fans had the opposite experience. Though Brands was expected to show up at the premiere of his movie, “BRAND: A Second Coming,” he cancelled his appearance hours before the event started. Read our review of the movie here. Update (10:01 a.m,):Three days after Austin-Bergstrom International Airport officials said Uber drivers were banned from operating at the airport, city officials reversed the ban on a temporary basis — that will, yes, include the duration of South By Southwest. Read more about the ban, and its reversal, here.